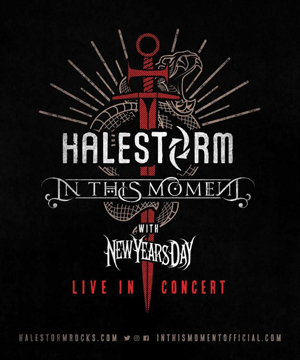 "You asked for it, and now you're gonna get it," said HALESTORM frontwoman Lzzy Hale. "I'm so excited to announce the third leg with my empowering, beautifully Vicious women! Three tours and we don't show any signs of slowing! We are joined by our friends in IN THIS MOMENT and NEW YEARS DAY starting in November! Get your tickets now because you don't want to miss this!" "We are so beyond excited to be announcing the third leg of such an empowering and beautiful tour," said Maria Brink of IN THIS MOMENT. "We knew after completing the first leg that this was something people were going to be paying attention to, and it felt strong, it felt powerful, and it felt liberating. I am so excited to see everybody at the upcoming shows!" "Touring with Maria and Lzzy has been, by far, the best touring experience I've ever had," said Ash Costello of NEW YEARS DAY. "I am lifted up and supported by the amazing women of this tour, and everyone feels as if they are family who are rooting for each other to kill it every single night. The positivity is incredible on a personal level. Not to mention, the shows are absolutely ferocious. I am honored to be on stage with these incredible women of metal and rock once again! And honestly, I hope there's no end in sight!" Tickets go on-sale this Friday, July 27, the release day of HALESTORM's fourth album, Vicious, now available for pre-order.